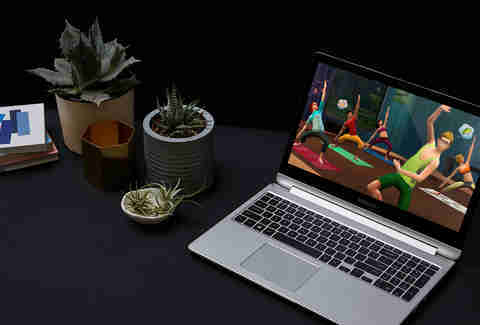 If you’ve ever had to contort yourself into seven poorly executed yoga poses to get through a movie you’re watching on your laptop, you’ll be relieved that the Samsung Notebook 7 spin was basically designed with the binge-watcher in mind. 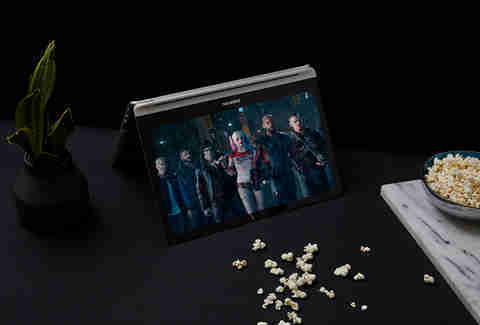 You can just rotate the laptop’s display into its stand or tent mode for hands (and lap) free movie nights. If you also want a better picture (and who doesn’t?) you can hit the function key and F10 to turn on Samsung’s Video HDR mode, which will sharpen contrasts while making colors and textures vibrant. You’ll see the biggest difference in visibility for darker/grittier films when in the Video HDR mode. Life is too short to waste valuable minutes on things like waiting for your computer to boot up -- there’s just too much internet to browse. And thankfully, that’s over with the Notebook 7 spin. The high-end 15.6in model comes with a 128 GB solid-state hard drive, or SSD, which is where the operating system, (or OS, for you techies) boots from. If that sounds like gibberish to you, here’s an explainer: the hard drive in most computers uses tech that’s been around since the ‘70s. It’s got glass discs in it that rotate and eventually wear out. An SSD is more like the SD card you put in your camera -- it’s quiet and Superman speedy. And while that SSD only comes with some more expensive models, those devices that don't have it (the standard 15-inch and 13-inch) are prepped for that upgrade if you want to make it. Besides handling video games, that big fancy processor also has another benefit for the more artistically-inclined: smoothly running editing software. If you’ve ever tried to run Photoshop on an older laptop, you know it’s a slow, painful process. Not so on the Notebook 7 spin, thanks to the Core i7 processor on the larger models. Also, the Windows app store has lots of options to literally make the tablet a canvas, like Fresh Paint or Artrage Touch. Maybe that fine arts degree wasn't a total waste? Now that we’re used to our phones being able to get a quick charge in just a matter of minutes, having a laptop take hours to charge can be a real pain. So, it makes even more sense that your laptop should need as little time tied to your outlet as possible. The larger models of the Notebook 7 spin can get two hours of battery life with just a quick 20-minute juice up, and a full charge takes only 90 minutes. The smaller models take 100 minutes to fully charge. Depending on what you’re doing, that could last up to 9 hours. That’s a lot of time no longer wasted fighting over an outlet at the local Starbucks, which is better for everyone. Just because you have an iPhone doesn’t mean it will only pair with a Mac, or an Android won’t properly sync up to a PC. Everyone seems to be playing together in the virtual sandbox a bit more these days. 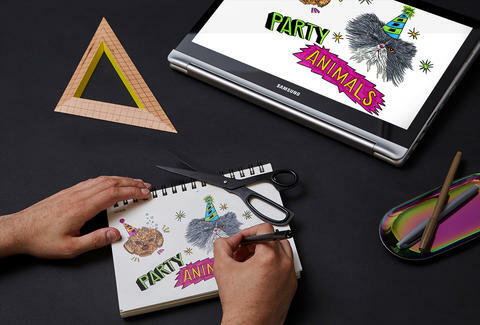 Windows 10 has a built-in phone companion app that, with the download of a few apps, make all your content on your device available on the Notebook 7 spin. But, if you do have a Samsung phone, you’ll get even more connected to this computer: Samsung has rolled out a new peer-to-peer wifi sharing platform that works seamlessly between your phone and Samsung laptop, making it crazy easy to send photos, notes, or contacts from your phone to computer -- no cord required. Now that’s some spooking magic. It still can’t make your coffee in the morning, though -- maybe version 8?